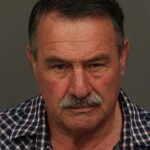 A 70-year-old Paso Robles man was arrested on Wednesday morning for allegedly robbing a Rabobank in Cambria earlier this month. San Luis Obispo County Sheriff’s deputies arrested Bruce Valentine after serving a search warrant at Valentine’s Heritage Ranch home. On Nov. 7, Valentine allegedly robbed the bank at gunpoint, disguised in a mask. Officers booked Valentine into the San Luis Obispo County Jail on suspicion of armed robbery. His bail is set at $250,000. While I agree with you on the issue of banks acting criminally, I would disagree with you on your comparison of an armed gunman robbing a bank as a “kid stealing gum balls”; the bank clerks were definitely in harm’s way; even if the man knew exactly what he was doing and had the safety on, unless the gun wasn’t loaded, there was a possibility that someone could have gotten shot, whether it would have been accidental or on purpose, someone could have gotten hurt or killed. Mr. Valentine will most likely spend a great deal of the rest of his life behind bars, rightfully so. I have to wonder if he had some sort of dementia /alzheimers episode. He has an otherwise decent history in the area as far as I know and this seems like highly uncharacteristic behavior from what I know of him.